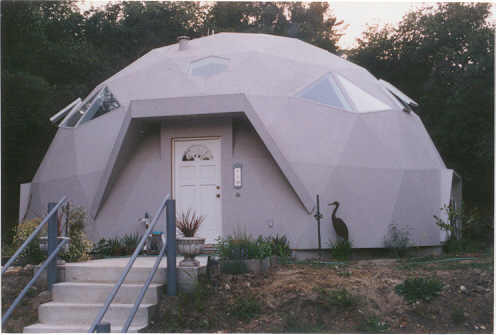 Evolving Dome Home Kits for Building Round Dome Homes since 1982. Earthquake, Storm and Fire Safer Round Homes. Precision Cut Kit Round Homes have Ten Equal Sides. Ten-Equal-Sided Foundation and Floor is Easier to Build. for Conventional Doors and Windows at no extra charge. is included at no extra charge. Extensions for doors and windows are not needed with this design. 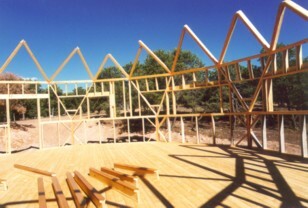 The ten-sided perimeter can accomodate many interior floorplans. Floorplans have many 90 degree corners for furniture and appliances. using lapping 60 mil TPO (thermoplastic) shingles or other proven waterproofing methods. to the exterior panels at the factory. Pre-cut insulated and ventilated exterior triangle panels are an option. Pre-cut triangular TPO shingles may also be ordered as an option. Insulation installed outside the the building framework is more effective than insulation placed between framing members. 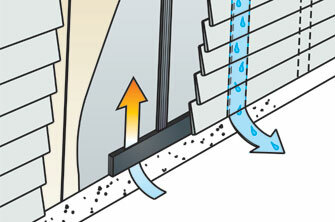 Ventilation improves energy efficiency and inhibits mold growth. from top to bottom, so you have a place to stand while working. This minimizes the need for ladders & scaffolding after the frame is assembled. Work can be done while standing on the sturdy assembled EconOdome frame kit. 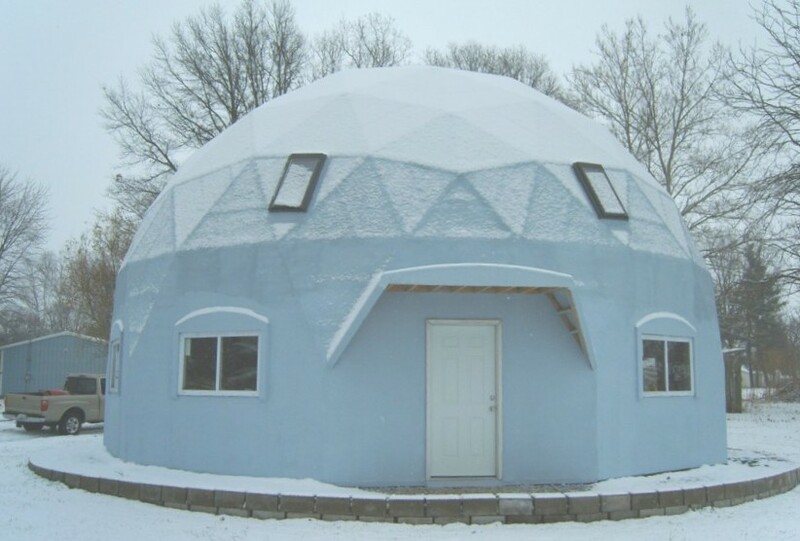 EconOdome Kits, Plans, & Methods help you to build an awesome dome home. 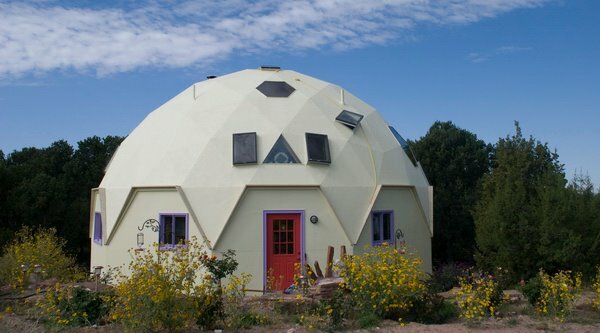 Tom and Kandy Abbott built this dome home located in Ramah, New Mexico. 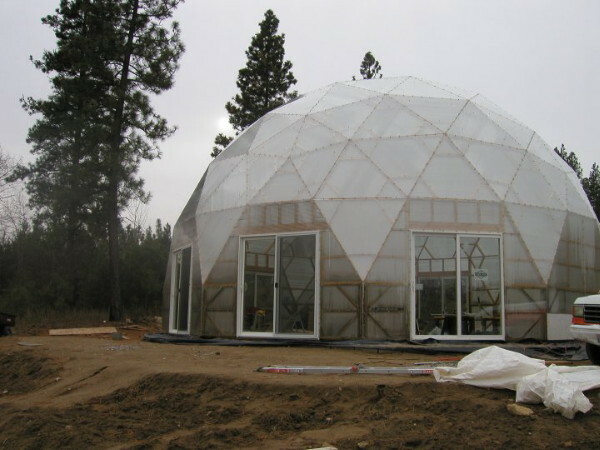 Tom is a skilled craftsman and authorized manufacturer of EconOdome Kits. An example of what can be yours, if you wish. An example of natural wood railings built by Tom. Another photo of natural wood railings inside Tom and Kandy's dome home. Many sizes and custom designs are possible. has been making EconOdome kits since 1984. Wil and Tom now work together on the design and manufacturing of EconOdome Kits. Wil will assist you with drawing custom plans. Tom will be manufacturing your EconOdome Kits. contact Tom via email at mesadome@yahoo.com or call Tom at 505-726-4616. Lapping TPO shingles provide one durable roof covering option. Click to see more pics of this 48ft. 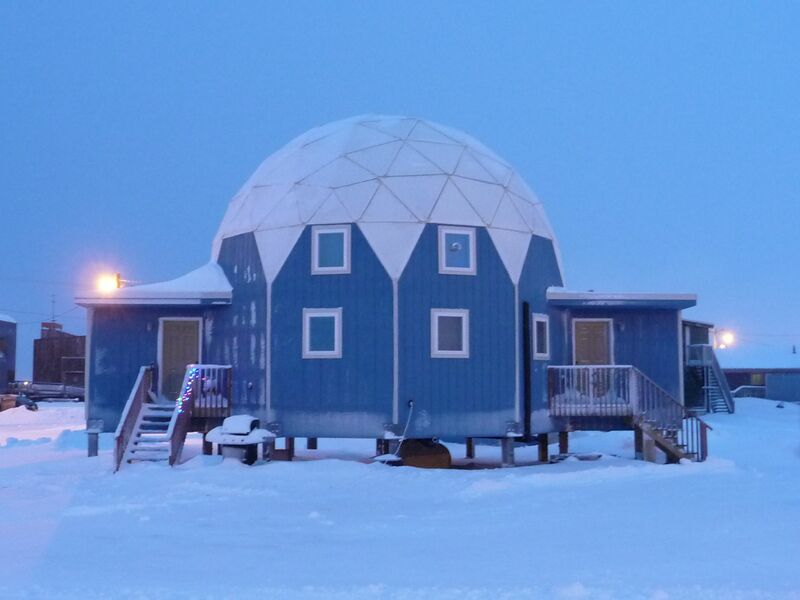 dome home. 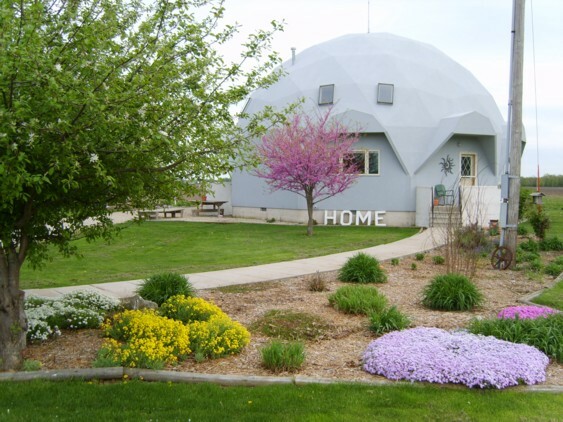 What Size Dome Home Do You Want? Do you want More Sample Plans and More Info? 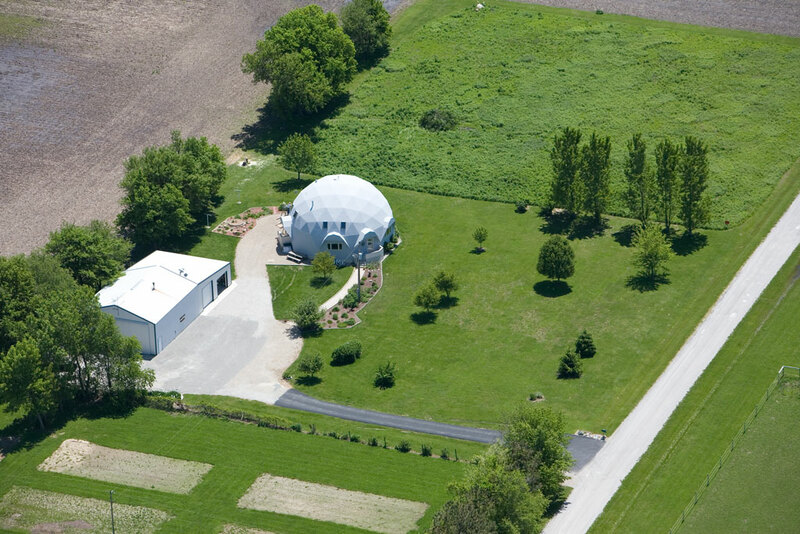 Wil's Dome Home is located in central Illinois, near the center of the USA. dome home floor plans, pics, & more info. Build with 30 ft. dia. Basic 2x4 frame kit costing $6,750. Or, build with 2x4 on 2x4 T-Beam frame kit costing $10,200. 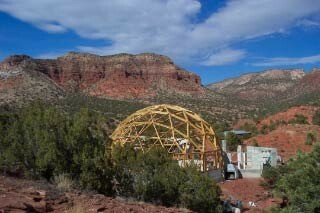 CLICK PIC ABOVE FOR MORE INFO ON THIS EXTREME DOME HOME. A partially assembled 38.5 ft. dia. 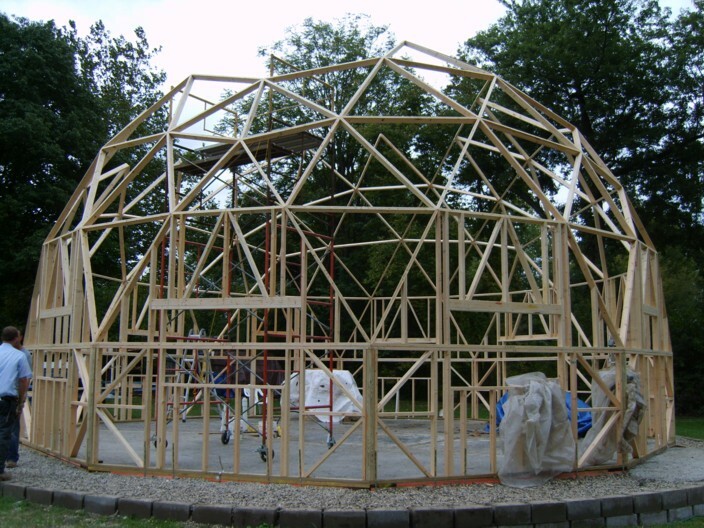 Basic 2x4 EconOdome frame kit. Click pic to see more. Earthquake, Storm and Hurricane Safer Round Homes. using lapping 60 mil thermoplastic (TPO). Insulation installed outside the the building framework is very effective. Tom and a friend are completing the assembly. May build with 38.5' dia. Custom Floor Plans / Layout Plans...for any size dome cost $75. Complete Custom Plan Sets...cost one dollar per square foot ($1,800 minimum). We have many floorplans in stock. if, you send us an e-mail describing your ten-sided dream home. that matches your description as closely as possible. the cost, including five revisions, is $75usa. A floor plan is the internal layout only. 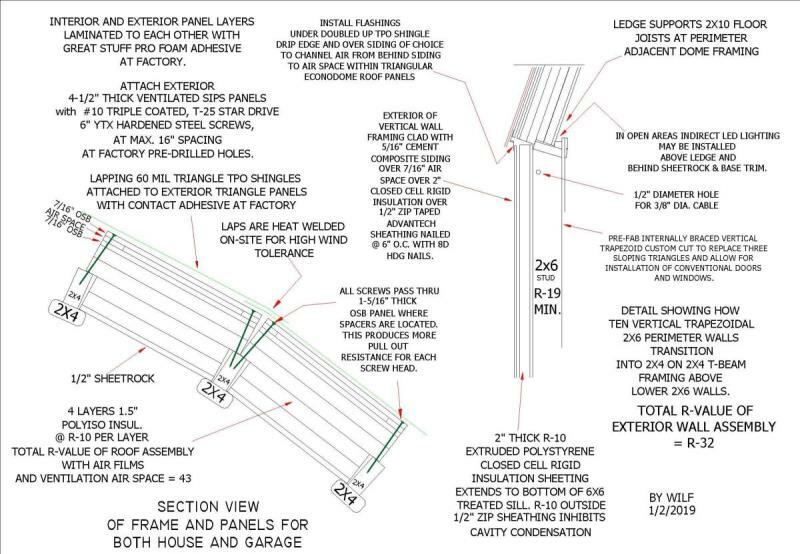 complete detailed custom plan set can be drawn. cost of a complete 20+ page construction plan set. Revisions of floor plans are handled by e-mail. Push "Buy Now" below these words. one US dollar per square foot ($1,800 minimum). The minimum complete plan set charge is $1,800. a $900 deposit is required to begin the drawing process. please push the "BUY NOW" button below these words. There are many ways that the exterior can be waterproofed. with conventional shingles or with large lapping TPO shingles. with contact adhesive to enable you to seal your dome roof quickly. create a 6" total lap when installed on the dome roof. 6" screws are inserted into precisely pre-drilled holes in the panels. then the overlaps are fused with a digital heat gun & small silicone roller. The digitally operated Wagner heat gun costs $40 at Home Depot. Or, you can purchase a professional Leister heat gun for about $500. 850 degree F. temperature needed to properly heat weld TPO. really helps to ensure that all laps will hold tight in high winds. while moving the roller back and forth behind the nozzle. lapping TPO shingles will not blow off and will keep your home dry. panels for the heavy duty 6" screws. under both the siding and roofing. warm and moist air is allowed to escape. just behind the bottom edge of the siding. is attached behind the bottom edge of the siding. SV3 keeps the bugs out of the vent space. more easily repaired following a violent storm. "EconOdome Kits" for a reason. manufactured by Faze Change Produx. that is called, the "Loft Ledge" frame kit. 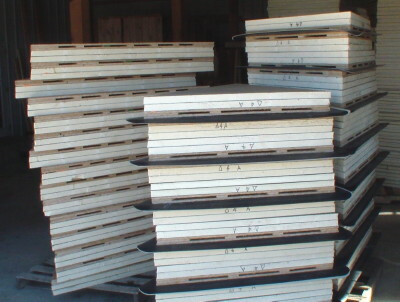 that are used to complete the top of the EconOdome frame kit. 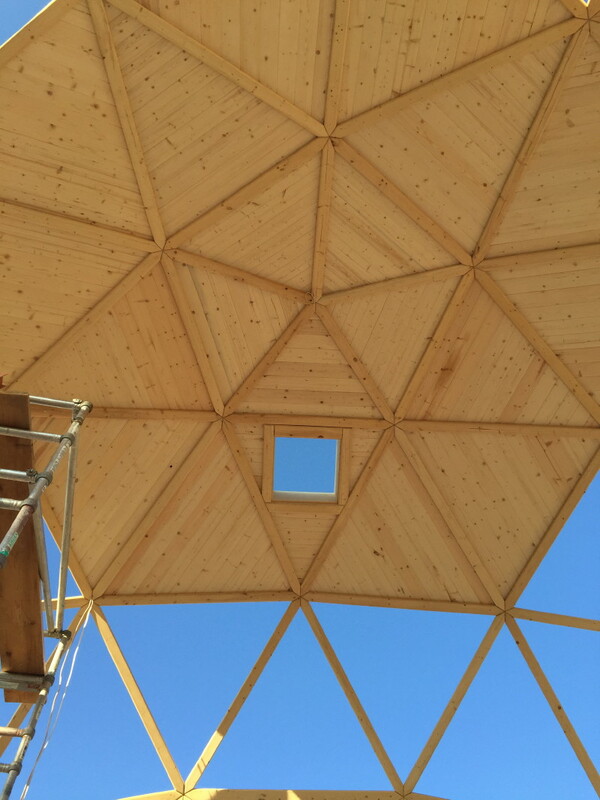 and, the top of the dome is made with 2x4 lumber. because 2x6 lumber is thicker than 2x4 lumber. support the second story loft level. 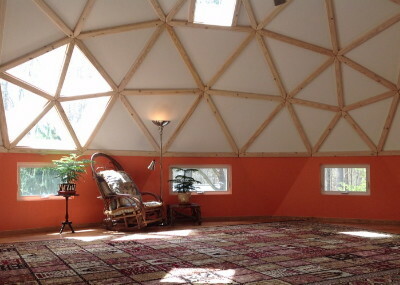 easily construct a loft level within a dome. than a "Basic Loft Ledge" frame kit. 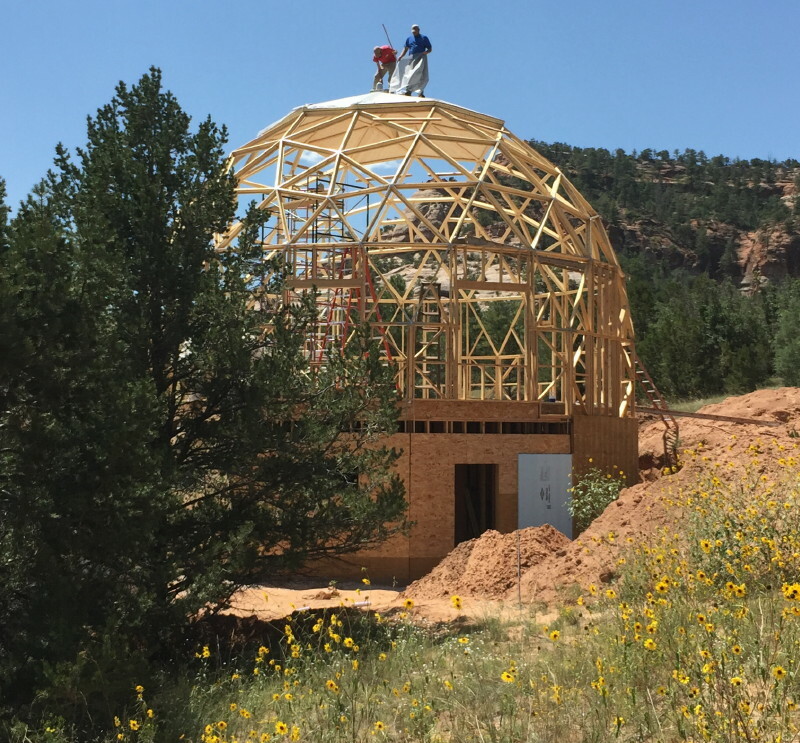 See drawing at left of "Loft Ledge Frame Kit"
This southwest style dome home in New Mexico includes a large sunroom between the house and garage. This home also features custom interior woodwork and three floor levels above the walk-out basement level. Eric and Buena Kaylor lived in the camper while their home was under construction. 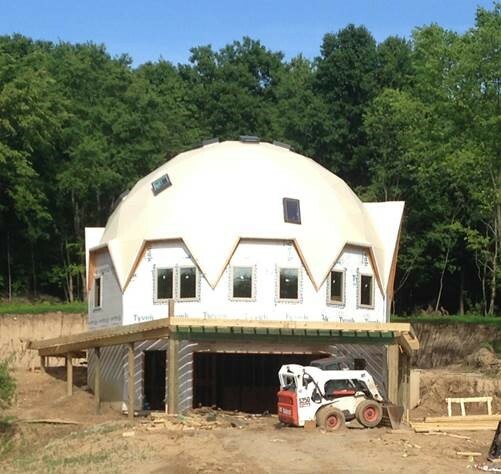 Click Here for unedited dome home building story by Steve Butterworth. 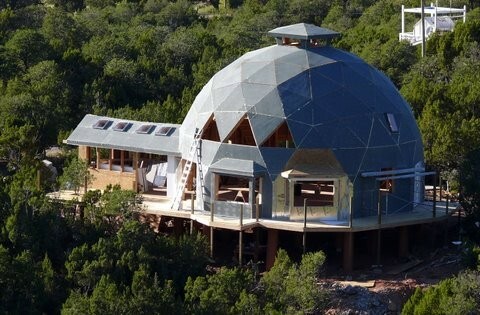 This dome home was built in New Mexico and is clad entirely with fire safe DensDeck Prime Roof Board. 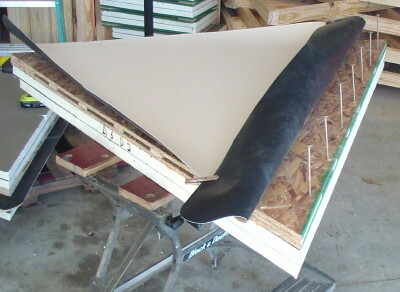 One inch thick R-6.5 insulation board was glued to the back side of the DensDeck sheeting prior to installation. The exterior was then sealed using a proven commercial roof sealing method called "the saturated seal". waterproof large and expensive commercial buildings such as hotels and office buildings. Commercial waterproofing systems undergo rigorous independent testing. Many commercial waterproofing sysems work well on EconOdome buildings. rigid insulation sheeting on the exterior of the building. more energy efficient and also more storm tolerant. can help you with the often required professional engineering approval. nearly everywhere in the USA and also elsewhere in the world. 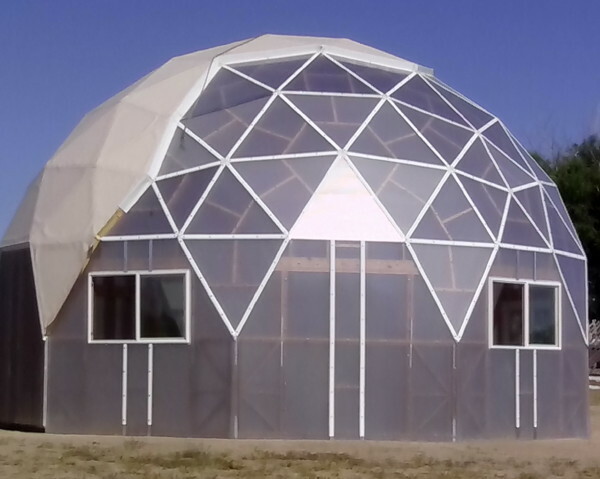 built with a 2x6 Basic EconOdome frame kit. 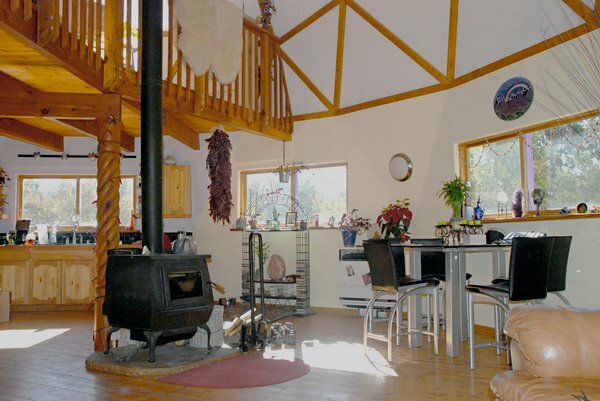 The cupola on top helps with natural ventilation. The sunroom will help with passive solar heating. 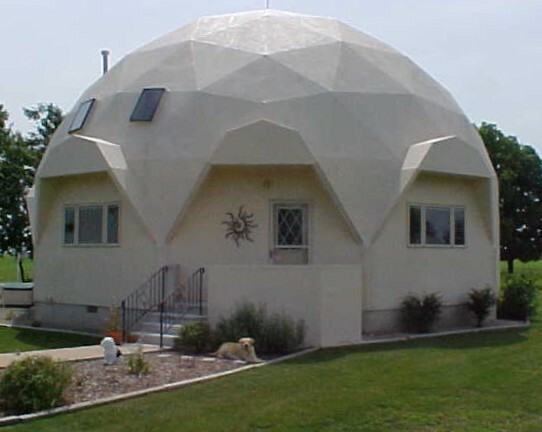 Want a spacious dome home for about $40,000. How can this be done? With EconOdome kits and your labor. and retained bed of gravel. We call this the "MesaBase" floor and foundation. Click Here & scroll to see MesaBase info. 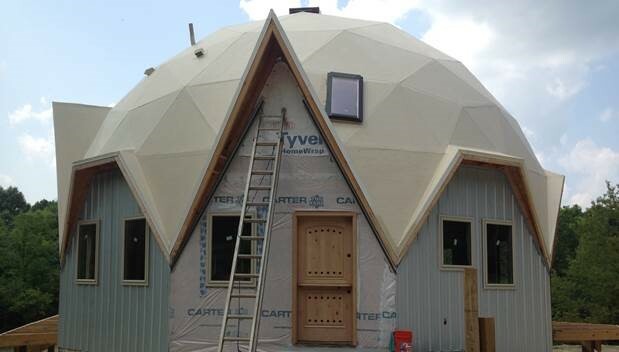 The Basic 2x4 EconOdome frame kit used to build this home costs $8,250. 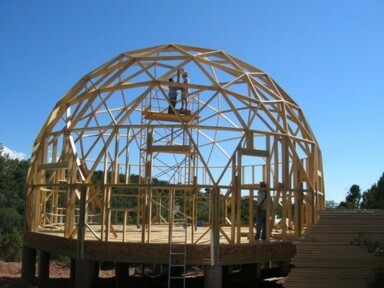 labor-saving "all 2x4" T-Beam EconOdome frame kit costing $13,600. To create two complete floor levels inside you need a riser wall kit. The five feet high 2x4 riser wall frame kit costs $1,750. All other materials may be purchased locally. Optionally, you may wish to order: pre-cut insulated triangles. 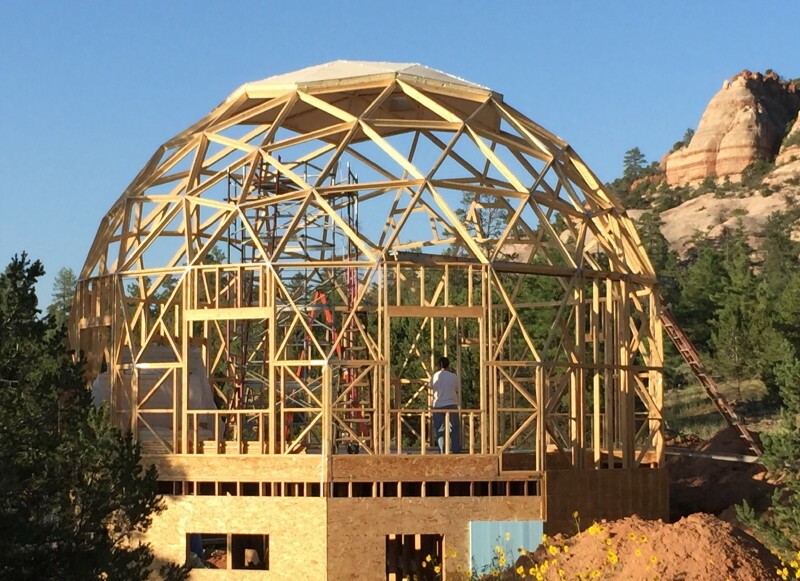 This 38.5' diameter dome will have 2,000 sf on two floor levels. Cost to completely enclose & weather proof is about $20,000. Cost to complete the interior is about another $20,000. Click Here to download and view video of dome raising party. to move warm water thru pex pipes within the concrete floor. Riser walls + window & door frames are put together at the factory. The building was framed up to ten feet high in just one hour. The rest of the boards (struts) were put up one at a time. 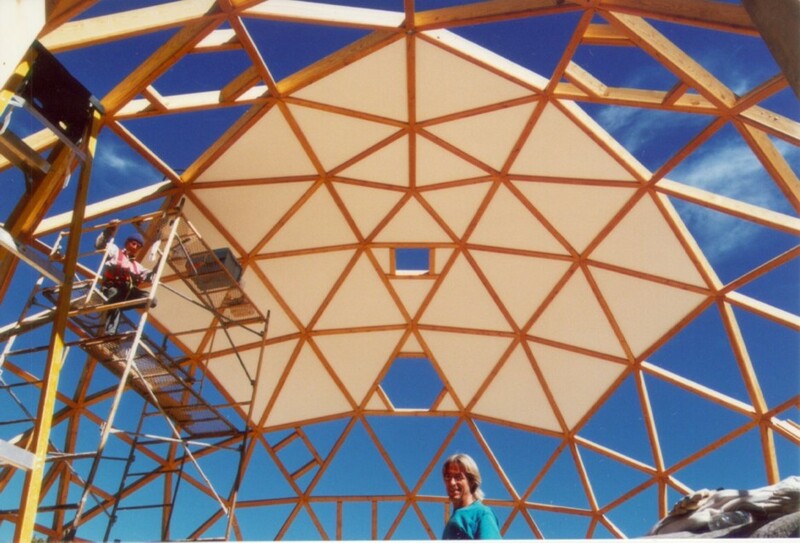 finished putting the dome framework together the next morning. 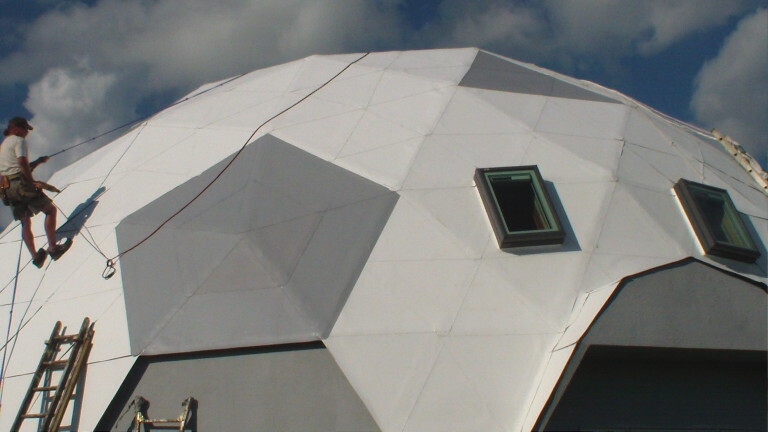 rigid insulation and DensDeck cover this dome. 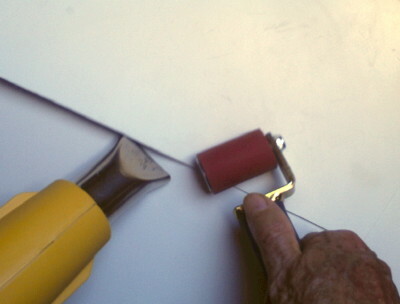 Screws with large washers are used to install the triangle panels. The seams and washers are covered with cloth saturated with resins. More waterproofing is applied to the surface with paint rollers. When the waterproofing is thick enough the dome home will not leak. that the painted on elastomeric waterproofing is waterproof. 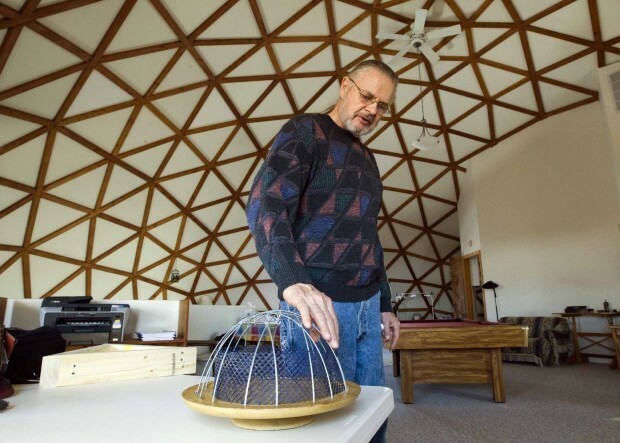 by transfering heat from the top of the dome to the earth under the dome. This 30ft.dia. biodome built in Colorado has polycarbonate on the south side. Insulated and ventilated triangle panels with TPO roofing are on the north side. A multipurpose loft may be suspended inside with chains that are attached to the ceiling of the EconOdome framework via "eye" bolts positioned at the nodes. What the people say about building with EconOdome kits. A "Fuller" Explanation & What Now? 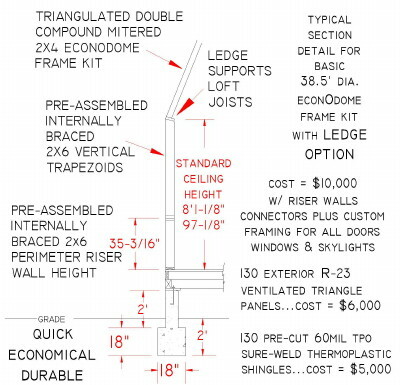 The EconOdome home design begins with the end in mind.